A surprise appearance from U.S. Rep. Pramila Jayapal whipped the full house into a froth before Ben Gibbard and crew took the stage. No one has ever lamented a lack of public officials crashing highly anticipated rock shows. But a surprise appearance from Congresswoman Pramila Jayapal, whom Death Cab for Cutie invited to introduce them Saturday night, whipped the Paramount Theatre crowd into a froth. Stalling for time, ace comic and former Seattleite Hari Kondabolu dug deeper into his bank of reliably lefty bits that had played well with a liberal Western Washington crowd all night between bands. 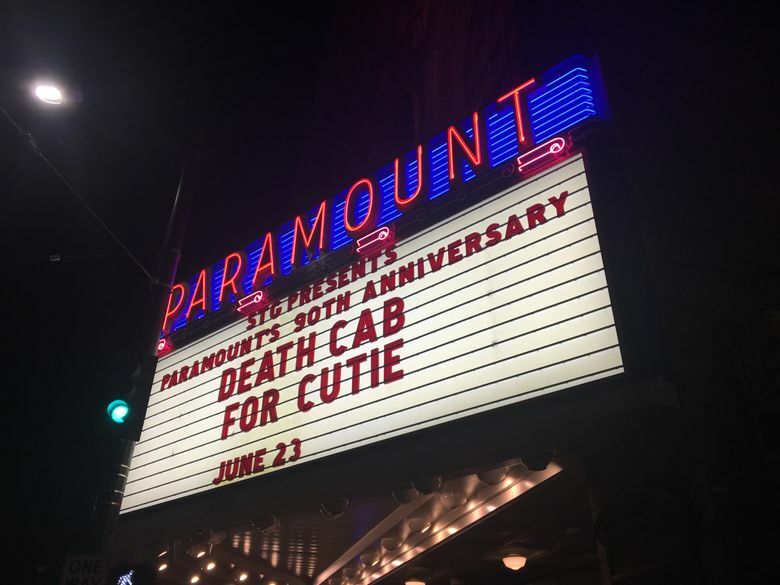 After receiving an offstage signal, the former Seattleite tasked with hosting the Paramount Theatre’s free 90th anniversary party Saturday night, headlined by Seattle-based indie-rock heroes Death Cab for Cutie, welcomed to the stage the surprise congressional guest who was there to make an introduction of her own. After briefly extolling the birthday building, Rep. Jayapal, D-Seattle — who now has a lucrative hypewoman career awaiting her should the whole governing thing get dull — spoke of her visit that morning to the SeaTac Federal Detention Facility where roughly 200 migrants are being detained. Recounting the story of a Salvadoran man who was hit with a machete 23 times by Honduran police isn’t typical rock ‘n’ roll pep-talk material. But this wasn’t a typical rock show, and her call to mobilize against President Donald Trump’s immigration policies electrified the liberal Seattle crowd. “Not only is Death Cab for Cutie an incredible band … but they are a band with heart that cares about the future of our country,” Jayapal said. As Death Cab main man Ben Gibbard strolled to the stage and dived into a tender solo acoustic version of “I Will Follow You Into the Dark,” the palpably jacked crowd matched him note for note, erupting after the intimate hit like Metallica had just blown the roof off the historic theater. The indie titans’ roughly 90-minute set was a euphoric release, climaxing a show rife with political undertones, starting with Kondabolu acknowledging, on behalf of organizers Seattle Theatre Group, that the theater sits on indigenous land. Drawing inspiration from the Black Panther party and Jimi Hendrix’s warbly psych-blues, beloved local power trio The Black Tones, the opening act, charged through their poignant single “The Key of Black (They Want Us Dead)” after stomp-and-clap spiritual “I’m Gonna Cross the River Jordan” found singer/shredder Eva Walker trading her guitar for a harmonica. Kondabolu kept things moving during set changes with bits about being weirdly mistaken for a certain redneck rap-rocker and getting heckled by a more famous comedian. The diverse and eclectic lineup truly bore the fruits of inclusive programming, with sprawling fusionist ensemble Khu.éex’ melding Native American song, dance and spoken word with funk, rock and jazz. “Let them children free / we all family,” led vocalist Nahaan in a hip-hop-esque protest chant referencing the migrant children separated from their families. The political undertones largely dissipated as Death Cab tunneled deeper into their set of familiar indie-rock hits and a few newbies off their upcoming “Thank You for Today” LP, their first without key member Chris Walla, due Aug. 17. Amid a leadoff run of fan favorites — including the brooding “I Will Possess Your Heart” and “The New Year” — Gibbard grew frustrated with a nagging pedalboard issue, ditching his guitar altogether on the latter. Though the emo-tinged anthem lacked its usual might, the crowd roared as Gibbard stomped around the front of the stage unfettered by his instrument. “There’s a joke in there about you get what you pay for,” the singer quipped afterward. Being a free show, it wasn’t strictly Death Cab die-hards that filled the ornate theater following a small preceding block party, which included a Pride-weekend showcase of LGBTQ artists, making the crowd’s early enthusiasm all the more impressive. It also made for a slightly more neutral testing ground for new songs like stutter-stepping new single “Gold Rush” — which touches on the changes in Gibbard’s Capitol Hill neighborhood — that the band speckled in among material culled largely from its heralded mid-aughts records. One of the new record’s standout tracks, “Summer Years,” is a gauzy tune with haunting synth lines slowly built up over Jason McGerr’s skittering, frenetic drums. Between the earlier rousing political moments and Death Cab’s sonic eloquence, it was easy to forget that this was in fact a celebration of the 90-year-old venue. At least until the homegrown star sang the theater’s praises midway through their set, recalling seeing his first “real show” at the Paramount, Sub Pop’s Ultra Lame Fest back in 1992. “I never thought when I was a kid sitting way the (expletive) up there that I’d ever be on this stage,” Gibbard exclaimed.